Compiled from email correspondence between Don Lingousky and Louise Genetti Roach (webmaster of this site) during 2015. Please click on the individual photographs to view in a larger format. Angela Genetti with husband Raffael Recla, Peter Zambotti with wife Anna Maria Genetti. Angela and Maria were sisters. About 1895. Don Lingousky is the great-grandson of Angela Maddalena Genetti Recla. Angela, also known as Angeline, was the daughter of Leone and Cattarina Genetti. She was the sister of Damiano, Giuseppe and Raffaele Genetti. Born in Castelfondo, Austria (Italy) on Christmas Day 1865, Angela arrived in the United States in 1882 at the age of sixteen. She married Raffael Recla in 1887 and they had six children within eight years. Four children survived to adulthood. By 1896, Raphael tragically passed away at the young age of 32, leaving Angela a widow. But being a strong Tyrolean woman, Angela persevered. 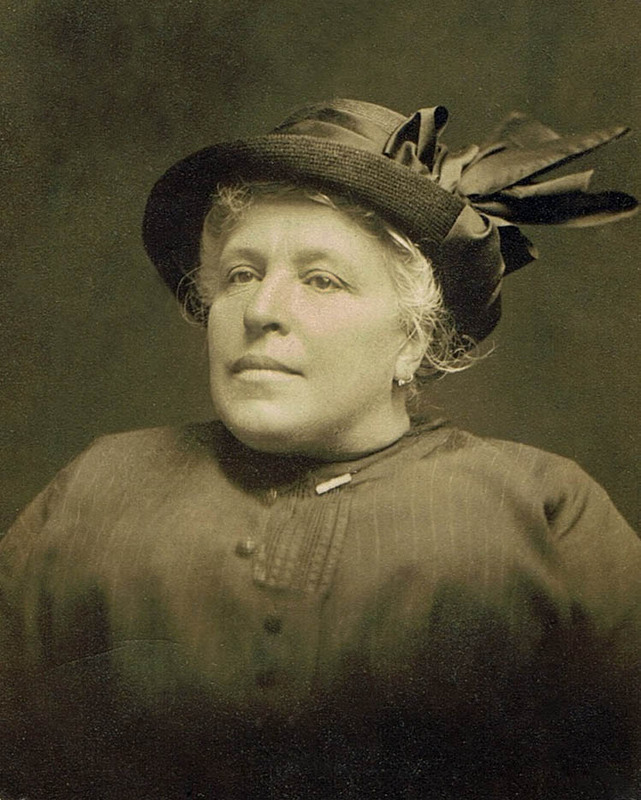 She ran a thriving business in Sheppton, Pennsylvania and adopted a baby boy (Henry Parisi) in 1906, adding another son to her family. Here are a few glimpses into Angela’s life from her great-grandson, Don Lingousky. Lawrence (9 Dec 1887 – April 1963) – married Kathryn Piz and had four children. Frances Catherine (20 Feb 1889 – 23 Feb 1937) – married Jack Brice and had four children. Leonela (2 Nov 1890 – 18 Jan 1979) – married Bernard Thomas Lingousky and had three children. Agnes (26 May 1892 – 30 Dec 1929) – married Thomas Swetz and had no children. Mary – (? – before 1900) – died in childhood. Albert – (16 Dec 1895 – D: before 1900) – died in childhood. Angela Maddalena Genetti Recla, 1865 – 1937. Angela was Don Lingousky’s great-grandmother. Date of photo: before 1937. Don: Angela always said she had prayed for a favor and promised she would adopt a child if what she prayed for happened. Somewhere I have records for Henry Paris (Parisi on his birth certificate, who was also Tyrolean) and will look for those next and forward what I find. Don: Angeline lived in Lattimer, Pennsylvania where her marriage license was granted. 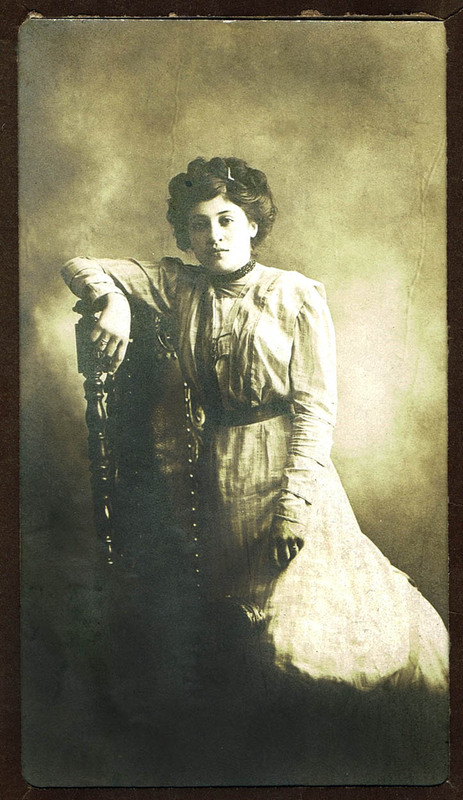 My grandmother, Leonela, used to tell the story that Angeline, her mother, worked as a domestic for the Coxe family in Lattimer (a prominent family who owned anthracite coal mines in Pennsylvania), when she first arrived in this country. Eckley and Sophia Coxe cared deeply for their workers and believed that if you had more than your neighbor then you should share some of what you have. They provided scholarships for miners who could not attend school, and tried to treat their workers fairly. Although the couple never had children of their own, they wanted to make Christmas special for the families and children of their workers and would spend hours and money every year shopping for and buying presents for every person in Drifton and providing a Christmas dinner. Sophia was known as the “Angel of the Anthracite Fields”. Although never a student a Lehigh, Coxe was very dedicated to the university. After his death, Sophia stayed equally faithful to the school and donated over 10,000 items from his working engineering library to the Lehigh collections. She also gave money for construction projects and funded the Coxe Mining Engineering Laboratory that opened in 1910. She created an endowment for its maintenance. 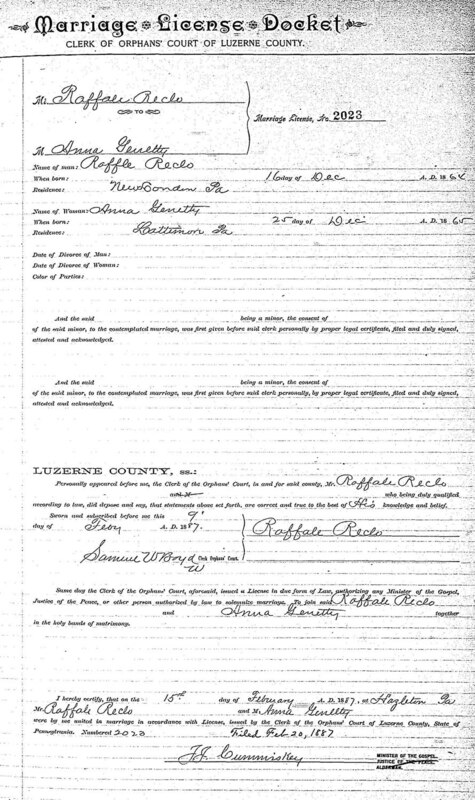 Pennsylvania marriage license for Angela Genetti and Raffael Recla – Feb. 15, 1887. Don: I just found some more old records in my aunt’s papers. Apparently someone wrote down an oral history provided by Uncle Henry’s wife, Hazel, quite a few years ago. It is her recollections, so it is the family story as told by her with probably a lot of second-hand information, so I would take it with a grain of salt unless it lines up with everything else we know. 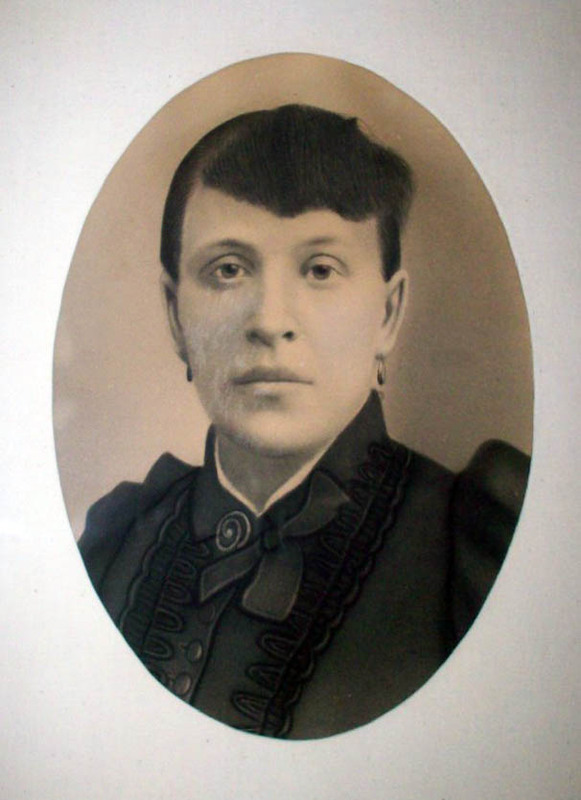 Angela Genetti was born about 1865. She immigrated to the United States about 1881, at the age of sixteen. There, she served as the housekeeper for Mrs. Coxe’s boardinghouse for Tyrolean rock miners in Jeddo, PA. Mrs. Coxe, the “Angel of the Anthracite Mines,” had brought the rock miners over from the Tyrol to get to the coal by blasting through rock. 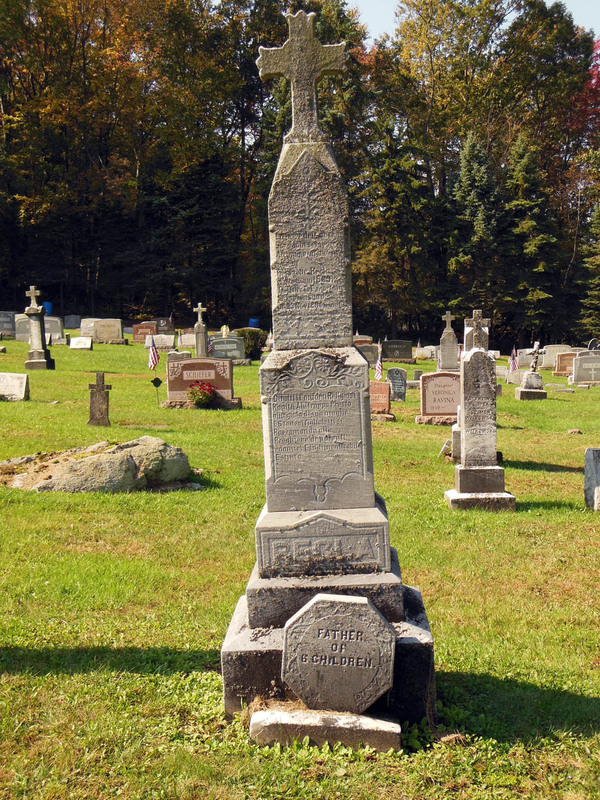 Tombstone of Raffael Recla, Sacred Heart Cemetery, Weston, Pennsylvania. Angela may have known her future husband, Ralph Recla, in the Tyrol, where he was a chimney-sweep before immigrating to the United States. In any event, they met again in America at Mrs. Coxe’s boardinghouse, where he was a boarder/miner. After marrying, they moved to Sheppton, PA. In Sheppton, they built a house with a connected meat market and clothing store. A barn was also attached. They sold clothing to the miners. The complex also featured a fourth-floor meeting room for the miners, which served as a chapel for mass once a month. Wooden steps outside took one to the fourth floor. 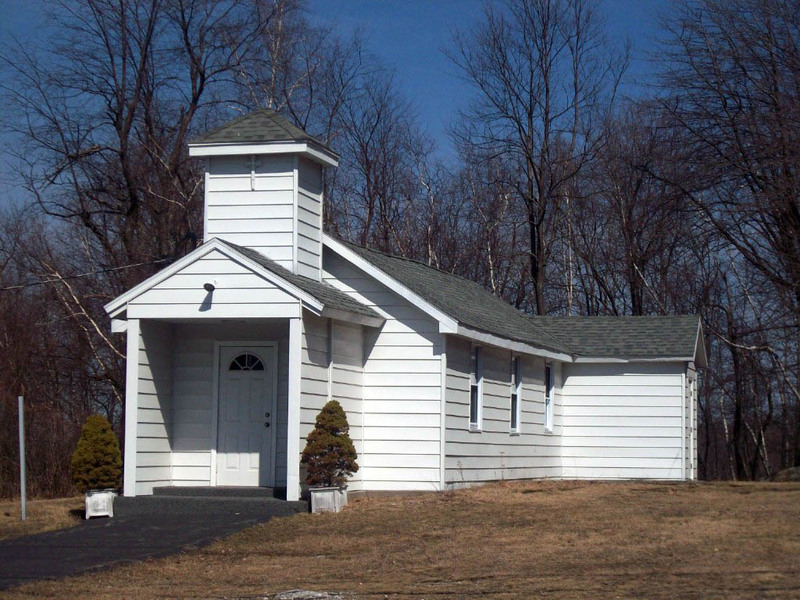 Angela had the little white chapel in Oneida, Pennsylvania built so there would be a place for people to pray and have mass. Close-up of Raffael Recla’s tombstone. Before the outbreak of World War I, Angela sent money so that her younger brother, Damian, could come to America. Damian was married in the Tyrol with at least one child, Gus. Damian arrived in American, and Angela loaned him $300 to start a door-to-door meat wagon business. 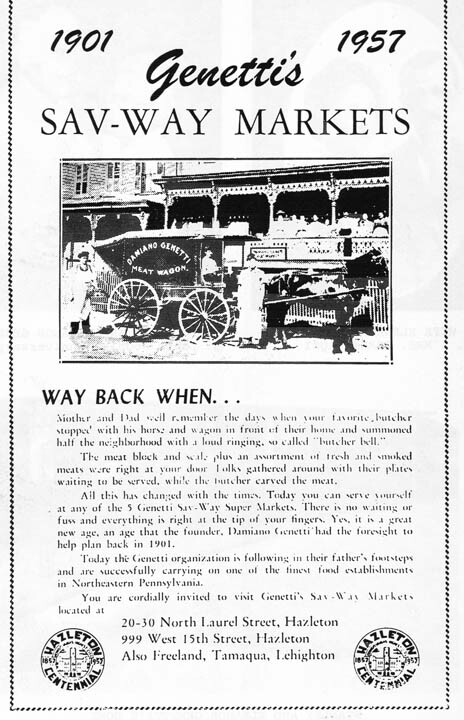 With a horse and wagon, he went selling, this was the beginning of the Genetti food market business. In time, Damian went back to the Tyrol. He sent for his son, Gus, to run the business in America. [Webmaster Note: Don and I both realized that the last paragraph of Hazel’s story had many inconsistencies compared to the family story later told by Damiano’s son, Stanley. Here are the facts according to Stanley’s biography and confirmed through historical documents: Damiano was Angela’s older brother (not younger), born in 1857 – eight years her senior. He immigrated to America and lived in Pennsylvania from about 1877 to 1888 working in the coal mines. Damiano sent for his bride in 1886, Oliva Zambotti, also from Castelfondo. They were married in Wilkes-Barre, Pennsylvania that same year and had one son, Leone, born in Lattimer in 1887. Damiano and Oliva returned to Castelfondo in 1888, where they had eight more children. He returned to Pennsylvania in 1902 or 1903 to establish a meat business (butcher shop and manufacturing of Tyrolean sausage). Stanley Genetti writes that Damiano borrowed a horse and wagon from his brother Raffaele who lived in Weston, PA at the time, to begin his business selling meat, handmade sausage and cheese door-to-door. 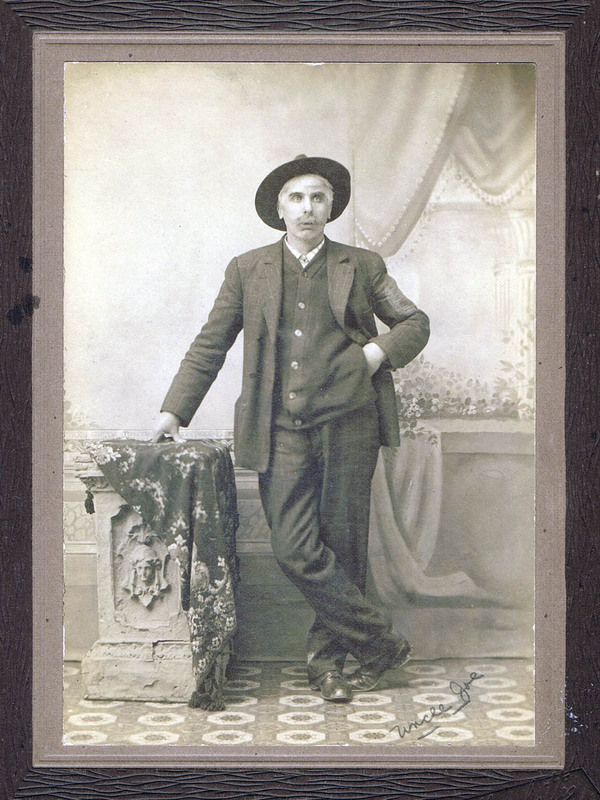 According to immigration records, Damiano’s oldest son, Leone, arrived in 1904 at the age of 17 to help his father in the business, with the rest of the family following by 1906. 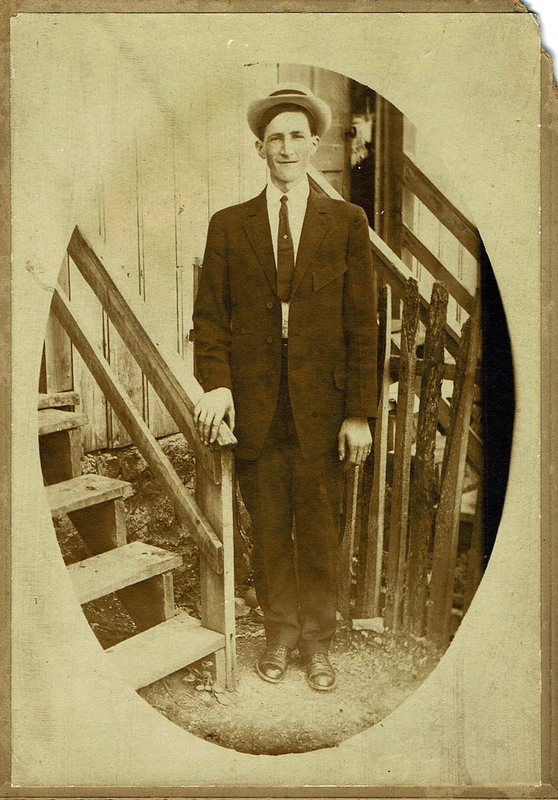 Gus Genetti, mentioned above in Hazel’s story, was only 12 years old when he arrived in America with his mother, Oliva, and the rest of his siblings. However, I did find clues within Hazel’s story that led me to new information, lending some credence that Angela may have lent money and/or a wagon to Damiano. 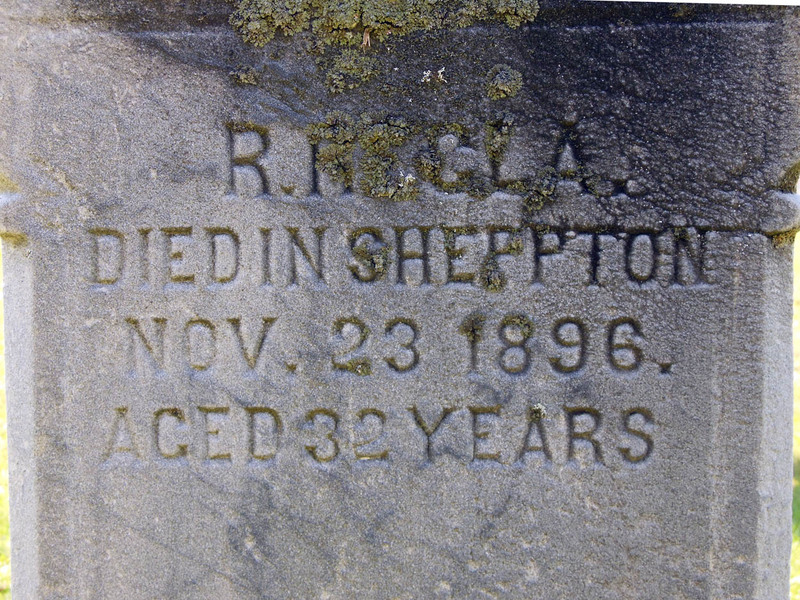 I found in the 1900 Federal Census that Angela lived next door to her brother Ralph (Raffaele) and his wife Lucia in East Union (Sheppton), Pennsylvania. Ralph’s occupation listed in the Census is Retail Butcher. Angela’s occupation is listed as Dry Goods, Boots, Shoes (obviously her shop). It appears that Ralph and Angela may have been in business together, sharing the same storefront in Sheppton. By the 1910 Census, Ralph and Lucia were living in Weston, PA and they owned a hotel/tavern. From the date on a group photo taken in front of the hotel (1906) and from Stanley Genetti’s biography where he states that Damiano boarded with Ralph at his Weston hotel when he arrived back in America for the second time in 1902, I surmise that Ralph moved to Weston soon after 1900. Putting all of these facts together, could mean that Ralph wanted to hand over his butchering business to Damiano so he could continue with his hotel/tavern. And if Ralph was in a joint business with his sister Angela, they may have both helped Damiano get started in business. Stanley writes that his father “purchased a buckboard and horse for $28 and converted it into a meat wagon. He sold his wares in Weston, but after nine months moved his business to Hazleton, PA.” All very interesting! I’m sure the truth is a combination of all of these stories. 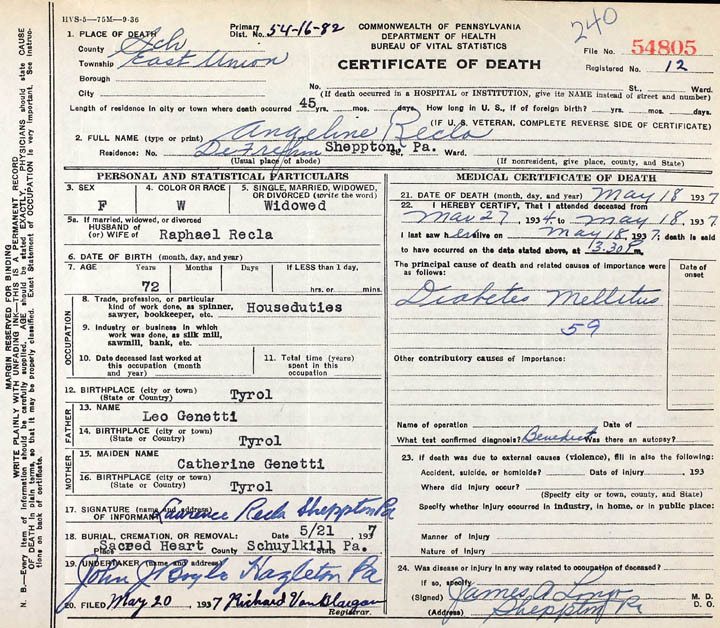 Pennsylvania Certificate of Death for Angeline Recla, May 18, 1937. Don: I was suspicious about the accuracy of Hazel’s story since she clearly had to hear it from others in the family who heard it from others and so on until it was most likely just like a game of “telephone” where all that remains true is that they all came to America at some point and that there was a wagon! About the only thing that may be accurate is that Angela came to the US when she was about 16 (per the 1900 census she said she arrived in 1882, although in the 1930 census she said 1886). Your detective work on Angela, Ralph and Damiano sounds right. In retrospect, I wish I had listened more and asked more questions as I heard the stories, but as a kid you just don’t think about things like that. Don: Here are a few more family stories. Leonela Recla (Angela’s daughter and Don’s grandmother), and Bernard Lingousky met at a dance, probably at her mother’s complex, when she was about twenty-two. After marrying and living in Sheppton, PA. for a time (in a house directly across the street from Bernard’s parents), they eventually moved to Hazleton. Another story I remember as a kid is that my grandmother, Leonela, said that the two horses they bought for pulling their wagon were retired circus horses. At times, especially when they stopped at railroad tracks, the horses would break into their circus routine. Maybe it was the train whistle that triggered them to do their routine, but my grandmother loved to tell that story. I used to know the horses’ names, but can’t pull up the memory at the moment. If I think of it, I’ll let you know. Also, my father remembered visiting Pete and Maria (Genetti) Zambotti’s farm in Weston. He described Pete as being gruff and Pete would get quite upset if anyone tried to eat his grapes that he was growing on the farm. Charcoal portrait of Angela Genetti Recla, artist unknown. From the family archives of Angela’s adopted son Henry Paris. Regarding my Uncle Henry and Aunt Hazel, they never had any children of their own, but they had one adopted son named John. John owned a gas station at the corner of route 93 and the Rock Glen road in Conyngham in the late 1950’s -early 1960’s. He did not go by the last name of Paris or Recla, but I can’t recall what last name he used. I remember helping clean it out when he sold it when I was around 8 or 9 years old – there had been a lunch counter with bar stools in the building. Henry and Hazel lived in Millers Corner (right where Millers road intersects Mountain Road) near Nuremberg for all the time I knew him (1950’s to his death). Tombstone of Henry and Hazel Paris, Nuremberg Cemetery, Nuremberg, PA. When I was a kid I spent several summers living with them. Hazel had a sister named Velma that we used to visit. Uncle Henry jumped off a porch and dislocated his hip when he was a child and doctors couldn’t fix it, so he had a terrible limp with one short leg his whole life. He had a fabulous sense of humor and managed to get around OK in spite of his leg. 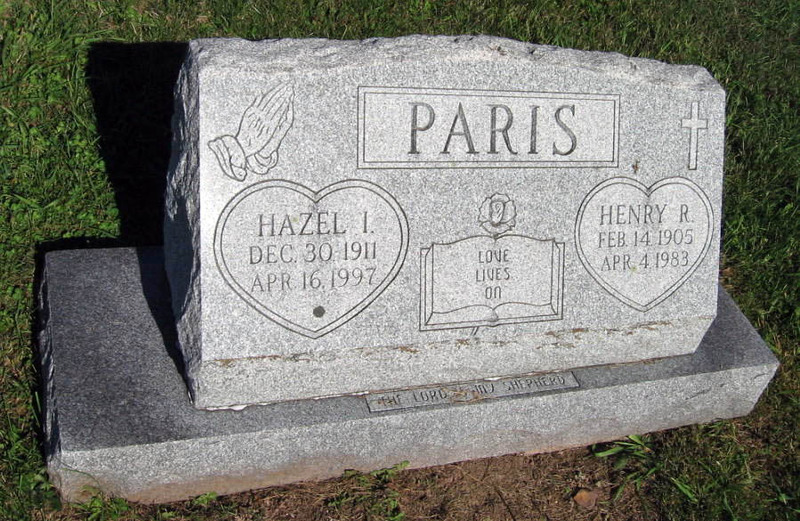 He and Hazel used the last name Paris, he never used Recla that I know of. He was a butcher at A&P for many years and was very popular with deer hunters for his butchering skills at hunting season! I made an attempt to locate his parents or other relatives in Tyrol, but apparently Parisi is like Smith – with 14 pages of them! I dug through the various accounts of my family history that I inherited and was reminded that Henry Paris’s nickname to everyone who knew him was “Pickles”. I do not know why he had that nickname, but when I went to Joe Recla’s transmission shop in Oneida a few years ago and mentioned Henry, Joe Recla said “You mean Pickles”. So it is a name that really stuck with people. Henry’s wife, Hazel, was Hazel Van Blargan. They were married in 1935. The chapel that Angela built in Oneida, PA. Recent photo by Don and Joyce Lingousky – 2015. 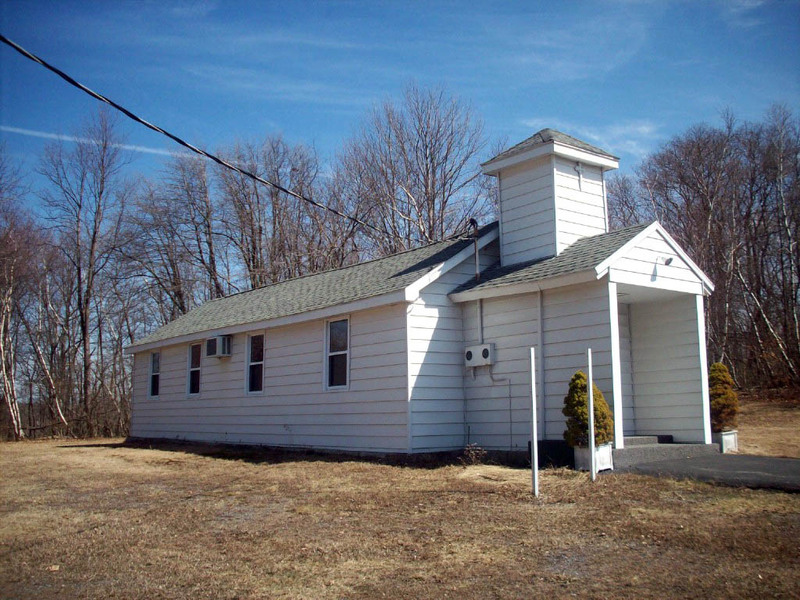 Don: Here are the photos from Oneida, PA of the chapel that Angela supposedly built. The electricity has been turned off (electric meter removed), so it is no longer is use. The property’s mailing address is 64 Chapel Rd., Pottsville, PA 17901. The last record they have shows it was sold to St. Joseph Roman Catholic Church on March 21, 1983. Current property taxes are a little under $700/year. We’re not sure which St. Joseph church bought it – there is one in Spring City, PA, but I called them and they don’t own it. We may have to go to the deeds office in Pottsville and see what they have on it. I got on the phone today and started calling the Schuylkill County offices to see if I could track down who currently owns Angela’s chapel. The recorder of deeds helpfully told me I could only find out who owns the chapel in Oneida if I knew the owner’s name! Fortunately, the tax office was much more helpful and I learned that the Catholic Diocese of Allentown owns it and the tax bills still go to the former bishop, Thomas J. Welsh. Bishop Thomas J. Welsh died in 2009, so I assume the current bishop of Allentown, John O. Barnes, pays the taxes on the chapel. 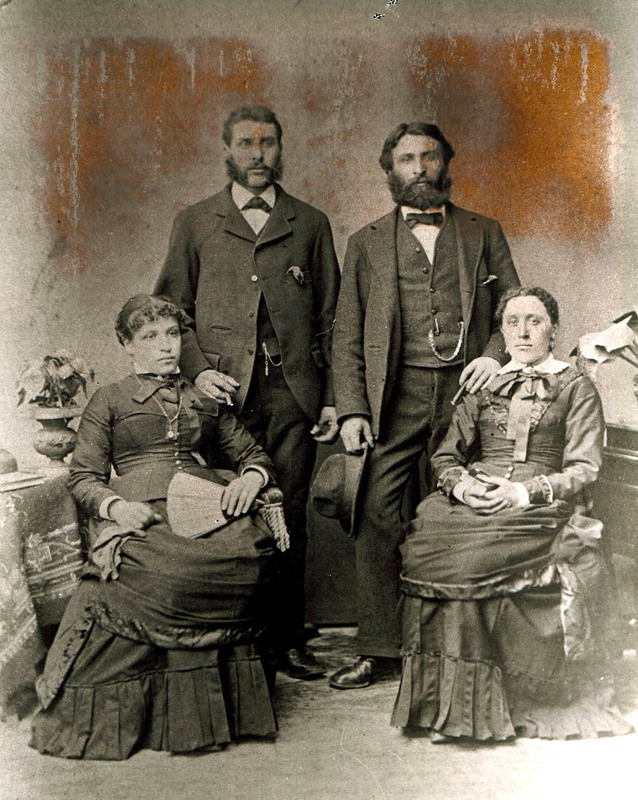 Giuseppe “Uncle Joe” Genetti, 1862 – ? Don: I have one more photo for you. I got this photo from my grandmother’s adopted brother, Henry Paris, years ago. It is labeled “Uncle Joe” and in my grandmother’s list of Angela Genetti’s siblings, she has an Uncle Joe listed. Family lore is that Uncle Joe went out west and wasn’t heard from again. He may be Angela’s brother, Giuseppe Genetti, born in 1862, but I can’t be 100% sure. Since my great-uncle, Henry Paris, was also the source of the charcoal portrait I have of Angela, so it is more likely that it is a Genetti than a Recla. I can’t find any records of the Reclas to see if there is an Uncle Joe there. From what I can find, it appears that Raffael Recla came to the country and died between census years and thus left no records of himself or his siblings – at least not any records that are currently available on Ancestry.com. I’ll keep digging, but I think it more than likely that this photo is Giuseppe (Joe) Genetti. From the photo I can’t tell if Uncle Joe was blonde or prematurely gray. Reclas seem to have all been dark-haired, I’m not sure about the Genettis of that generation, so not sure if that helps my argument for it being a Genetti! The photo of Uncle Joe has the studio name of L.C. Marchetti. That’s all the additional info on the photograph. I was digging through Ancestry.com yesterday and found a reference from an obituary for Maria Genetti Zambotti that Joe Genetti was a brother who was living in California. So that may be where the missing Joe Genetti went. My grandmother, Leonela, must have been impressed in some way with her Uncle Joe as she mentioned him fairly often, always the same story that he went out west and they didn’t hear from him again. But she also always said I look just like Uncle Joe. The rest of us don’t see any real resemblance from that one photo of Uncle Joe, but my grandmother was convinced, so who knows.